Before you skip over this recipe, hear me out. I realize that the recipe title doesn't sound like anything spectacular. And, if you're anything like me, you'll skim over the ingredients to decide whether or not it sounds like something you might like to try. I agree, these ingredients might not sound like anything particularly special. That was exactly what I thought when a friend shared this recipe with me several years ago. But my friend has great taste and had never steered me wrong with a recipe, so I decided to give it a try, and I am SO glad I did. 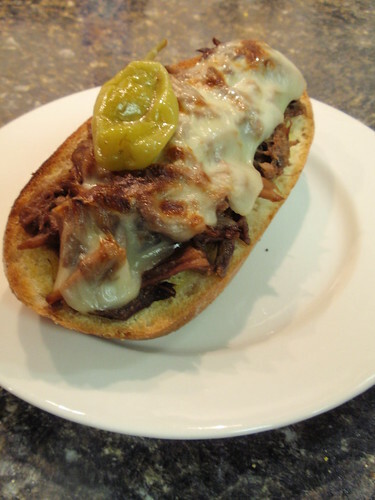 I made Italian Beef Sandwiches for a group of friends this past weekend, and I think, if they were honest with me, they might admit that when I told them what we were having for lunch and they heard the ingredients, they weren't overly excited. But I'm sure they will agree with me now. These sandwiches are WONDERFUL. The beef can be cooked in a slow cooker or in a large pot in the oven. I've tried it both ways, and have no preference. I was cooking for 10 adults, so I prepared 5 pounds of beef. I estimate a half of pound of meat per person. The beef needs to cook for about 6 hours, so this is a great meal for a gameday or a busy day on the lake. Give this recipe a try. You won't be disappointed. Combine all ingredients in a slow cooker or large heavy pot and stir together. If cooking in a slow cooker, cook at low for 5-6 hours If cooking in a pot in the oven, bake at 275 for 5-6 hours. You may want to check it periodically and add water if it seems to be getting low. The meat is done when it is fork-tender and falling apart. Shred beef in pot using two forks so that the shredded beef continues to absorb the liquid. Serve beef on open-faced sandwich rolls on a cookie sheet. Place provolone or mozzarella cheese on each sandwich. Place open-faced sandwiches under the broiler until cheese is melted and starts to brown. Remove sandwiches and serve. *My advice: You may not like pepperocinis. I don't either. But give one of these a try. They are amazing. Summer means dinner on the grill. 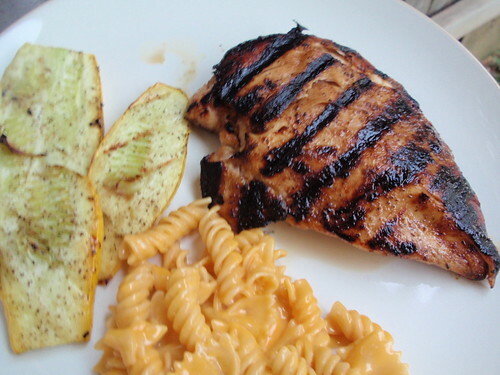 Here's another great way to marinade and grill chicken. We used boneless, skinless breasts, but I'm sure it would be just as great with bone-in chicken. This sweet and tangy marinade is a nice change to our usual salty and smoky chicken marinade. It's simple to throw together and only requires a few ingredients that you've probably got in the pantry. We also love vegetables on the grill. We seem to have a surplus of yellow squash right now. We like to slice the squash length-wise, brush each side with olive oil. Lightly salt and pepper both sides of squash. Grill on top rack for a couple of minutes on each side to your desired doneness (I don't think that's a word, but you get the point.) 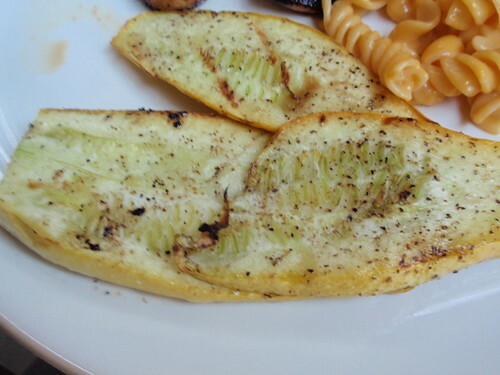 We like our squash a little crunchy. Simple and delicious! Pound chicken breasts to even thickness, approximately 1/2-inch to 3/4-inch thickness. Season both sides of chicken breasts with salt and pepper. In a large dish, combine oil, vinegar, honey, and garlic salt. Add chicken to large dish. Allow to marinate 1-2 hours. Grill until cooked throughout. Allow to rest for 5 minutes before serving. A great way to use up those extra peaches. This is so good! 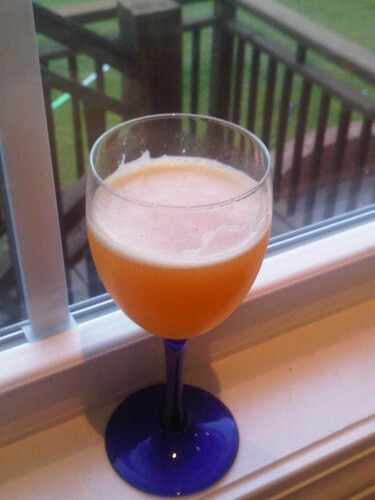 In the bowl of a blender or food processor, combine the peaches, peach schnapps, salt and a scant 2 cups of the wine. Puree until smooth and frothy, about 1 minute. Strain the mixture through a fine mesh sieve if desired (I skipped this step and preferred the thicker texture of the peach puree) and transfer to a pitcher. Refrigerate for at least 2 hours. When ready to serve, fill wine glasses with ice. Fill the glasses halfway with the peach mixture and top off the rest of the way with the additional white wine. Garnish with sliced peaches as desired. One of JB's favorite desserts is a cappuccino chiller from TCBY. It's a frozen coffee drink, and it is delicious. These frozen cappuccino cups are very similar, but think less drink and more ice cream. This picture does not do this dessert justice. They are wonderful - cold, chocolately, not too rich. So good on a hot summer day. In case you haven't heard, we're having a heat wave in Alabama. The heat index today was 105. You should make these now. They are THAT good. I should also mention that they're only 110 calories each. Place twelve cupcake liners into muffin cups. Crush cookies into crumbs. Add melted butter, then mix to combine. Press crumbs into twelve cupcake liners. Set aside. Mix softened ice cream with chocolate chunks, cinnamon, and nutmeg. 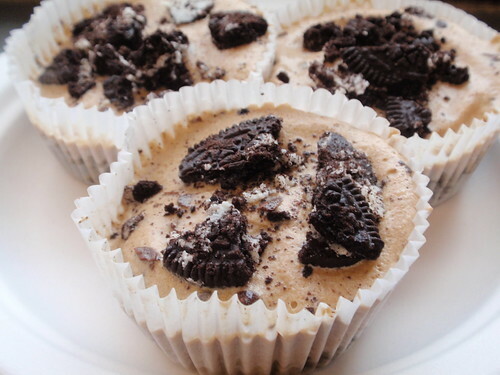 Spoon into cupcake liners. Freeze until firm, then remove from muffin pan (leaving on the cupcake liners) and place in a Ziploc or other airtight container. To serve, peel off liners, place on a plate, and top with any or all of the toppings. You can also just serve them in the liners. I love corn, but sometimes, I got over-zealous and buy too much of it. 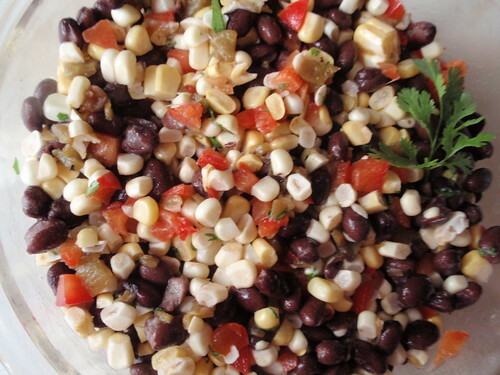 A surplus of corn is what inspired my search for this recipe. It is easy and light, and it's great for a barbecue or get-together with friends. Combine all ingredients. 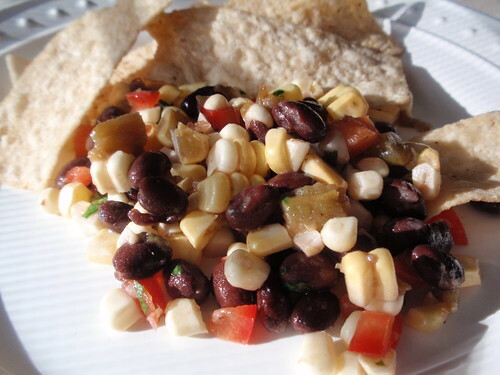 Serve with tortilla chips.